This month marks three years since the initial surge of the Gezi movement, and “June” has since become synonymous with progressive opposition to the authoritarian government In June 2013, a relatively small "Occupy" protest against the replacement of Gezi Park with a shopping mall in the central district of Istanbul triggered wide-ranging public demonstrations in Turkey. June is also Pride Month. Many people’s experiences and heightened awareness through the Gezi movement also played an important role in popularizing Pride parades in Turkey. Gezi protesters joined the 2013 Pride, and the event swelled to nearly 100,000 attendees, making it the biggest Pride ever held in Turkey. There is a direct ideological link between the two, and this link helps us to formulate and discuss the performative aspects of insurgent citizenship. A closer look at the invented spaces of activism in Gezi Park in its third anniversary helps us to appreciate all that is subsumed under Pride taking over the streets of Istanbul this month. The immediate goal of the Gezi movement was to defend the park and to protect it from demolition, but it transformed into weeks-long mass demonstrations against the government’s undemocratic rule at the local and national levels. In this process, Gezi Park functioned as both the physical and political space of activism, where citizens collectively defended the public against the private interests of government-sponsored capital. Social groups that had previously been hostile or at least viewed each other with great suspicion – members of trade unions and white collar workers, pious Muslims and anarchists, Turkish nationalists and socialists - stood with each other against the authoritarian government committed to restructuring their city. The Gezi uprising worked to transform citizenship in the contemporary neoliberal city. This urban contestation shows that beyond the invited spaces of participation, invented spaces of activism play a critical role in asserting citizens’ rights to the city and counter-development of exclusionary urban projects. 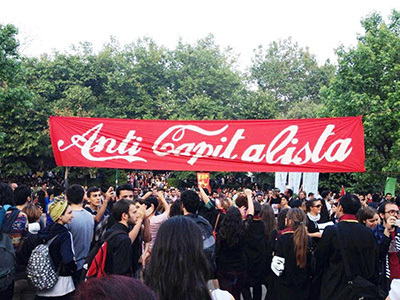 The Gezi movement needs to be understood as citizens’ practices of urban citizenship launched in response to neoliberal aggression and the assault on the public sphere – that is, a response to a form of economic, political, and spatial violence in which the legal procedures and market-driven planning principles are implicated. To combat the onslaught of neoliberal capitalism on people’s lives and livelihoods, government and market-sanctioned channels for citizen participation are insufficient. These invited spaces of formal participation created and/or sanctioned by authorities are often meant to contain the public interest and energy. To be heard and taken into account as citizens, people in Istanbul instead moved beyond invited spaces to invent new spaces and forms of action. Symbolic and performative aspects of insurgent citizenship practices are creative spatial practices that help to destabilize what is considered common sense in urban development and expand the realms of possibility and imagination for (re)development of urban space. Invented spaces of activism in the Gezi movement are effective insurgent citizenship practices with a clear – although not necessarily guaranteed - urban development outcome. These outcomes vary from the proposing of alternative urban development scenarios to simply the defense of existing urban spaces against the onslaught of aggressive profit-driven and market-oriented development projects. There are three particular cases of insurgent citizenship practice in the invented spaces of activism in the context of Gezi Park: The Resisting Piano, The Standing Man, and the Table on Earth. On June 13, 2013, German pianist Davide Martello gave an open-air recital in the center of Taksim Square. Gezi protesters and passerby enjoyed the piano recital for over 14 hours. The event quickly turned into an open mic, with participation of other musicians, performance artists, and audience members. The piano quickly became a powerful symbol of the transnational solidarity developed around Gezi Park. The piano was later confiscated by police following the raid on Gezi Park on Erdogan’s orders. Following the “detention” of the piano, people started referring to it as the “Resisting Piano” of Gezi. The piano recital is a part of the Gezi politics that “emerges where it is not supposed to be”.3 This insurgent act is a place-based tactic that resists the proposed demolition of Gezi Park and reinvents the square by giving it a new meaning through its imaginative use of public space. On June 18, 2013, a young man started an unorthodox form of protest in Taksim Square: standing still. He stood for eight consecutive hours in the square facing the Ataturk Cultural Center (AKM)4, which bore wall-sized posters of Ataturk, the founder of the modern Turkish state, with Turkish flags on each side. The act of standing while facing this figure provoked a collective memory of the foundations of modern Turkey that resonated with many of the Gezi protesters. Within the first hour, hundreds of people joined the Standing Man, and in a few hours news about the Standing Man of Taksim spread across the country through social media. Copycat protests cropped up all over the country in solidarity with the man, who literally stood up for the ideals of the Gezi movement. Standing Man challenged the police state’s codes for what constitutes acts of resistance, and bewildered the police forces on how to handle the supposedly passive protests of masses “just standing”. When citizens are excluded from meaningful participation, deprived of their basic rights of existence and dignified lives and livelihoods in cities, then collective assemblies of their bodies in one place is not only an expression of rage but also a refusal to be disposed. Protesters following the lead of the Standing Man emphasized the ‘thereness’ of the people as individuals and collectively represented the masses that refuse to be discarded. On July 9, 2013, after more than a month had passed since the start of the Gezi protests, people of Gezi gathered around the Table on Earth for the first day of Ramadan. Many expected that the nature of Ramadan would inevitably end the Gezi protests. Instead, the people of Gezi reinvented the space of the most popular street in Istanbul, Istiklal Avenue (Taksim Square stands at one end of Istiklal Avenue), blending the ideals of Gezi movement and the rituals of Ramadan. Following the public call made jointly by the two observant Muslim groups of Gezi protesters (Anti-capitalist Muslims and Revolutionary Muslims), people occupied the light-railroad crossing on Istiklal Avenue to break their fast. The function of the railroad was reinterpreted as a form of a dinner table, hosting hundreds of people sharing their food with one another. Gathered around the Table on Earth, as they named it, some were breaking their fast while others were only there to show their solidarity with the observing members of the Gezi movement. The railroad probably formed one of the longest and most diverse dinner tables ever set, in the middle of the most vibrant neighborhood in the city and surrounded by high-end luxury restaurants and bars. The Table on Earth is rooted in the idea of being equal on the very same platform, sharing and having access to the same goods under the same conditions. This symbolic act can be seen as an effort to experience real democracy that begins from the assumption of equality.5 In that respect, insurgent acts at Gezi in general and Table on Earth in particular can be interpreted as a ‘path to democracy’ in which equality is a starting point. 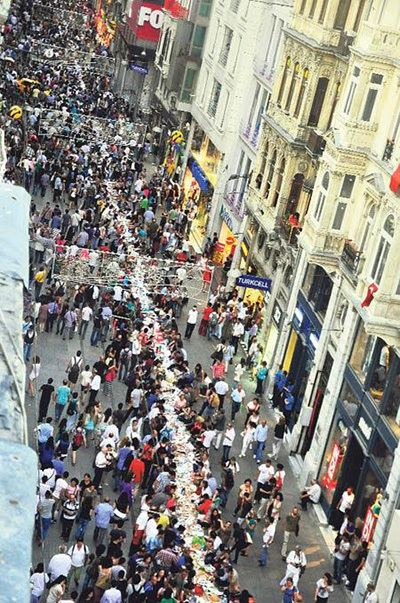 People sitting along the Table on Earth occupied the tramway and disrupted the flow of Istiklal Avenue, which is a key site of capital flows in Istanbul. By disrupting business as usual, people of Gezi created an alternative use for the space to reclaim their rights to their city. Producing new spaces for resistance and solidarity, people claim and practice their right to the city, a “right to change themselves by changing the city” and this transformation inevitably depends upon the exercise of a collective power to reshape the process of urbanization.6 The performative acts of protest in the Gezi movement provide empirical evidence about the power of people to develop a public sphere from below using the public space both as a cause and as a means for practicing new forms of citizenship. Deniz Ay is a researcher specializing in urban development, population displacement, and transnational planning. She is a doctoral candidate in the Department of Urban and Regional Planning at the University of Illinois at Urbana-Champaign. She received her master's degree in economics from the London School of Economics in 2009. Deniz Ay and Faranak Miraftab (2016) in Daniel Hammett and Jean Grugel (eds.) The Handbook of International Development. Palgrave MacMillan. 1 Merrifield 2014; Harvey 2012; Mayer 2009; Miraftab 2009; Irazabal 2008; Holston and Appadurai 1999; Purcell 2003. ￼4 AKM is also a part of the dispute over the Taksim Square redevelopment. It is home to multiple stages for performance arts, concert halls, and galleries. Besides its functional value, it has great symbolic value for Istanbul since it is associated with the modernization project led by the founding father of the modern Turkish republic, Mustafa Kemal Ataturk. Erdogan as the prime minister at the time also declared plans involving demolition of AKM and replacement of it with a ‘baroque’ opera house.